Homeowners, tenants and neighbors from across the city marched on the offices of Citibank and Cook County sheriff Tom Dart Wednesday to demand a moratorium on foreclosures and evictions. 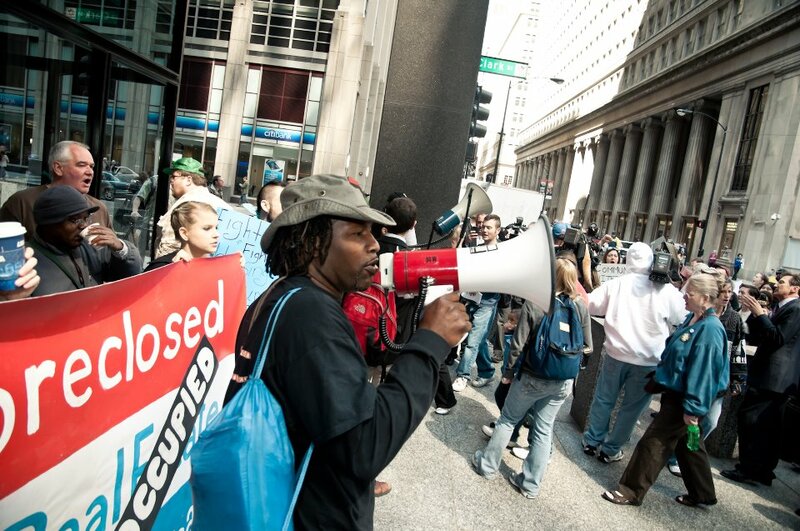 Communities United Against Foreclosure and Eviction -- CUAFE -- and Occupy Chicago won a commitment on Wednesday from Cook County Sheriff Tom Dart to hold a public meeting on an eviction moratorium in the coming weeks. That commitment from Dart came in the wake of the group’s Wednesday action in the loop targeting Dart and financial institutions that have foreclosed on homeowners across the region. Dart’s sheriffs are typically responsible for executing evictions in Cook County, the home county of Chicago and more than 120 surrounding municipalities. CUAFE is demanding that Dart stop all profit-oriented evictions and foreclosures for a year, beginning on the day of the action, May 16. They’d previously won a one-month evictions moratorium from Dart, but since then, CUAFE charges, Chicago has gone $25 billion underwater in mortgages to Wall Street. More than 100 homeowners, tenants and neighbors from across the city joined members of CUAFE, Occupy Chicago, the Chicago Anti-Eviction Campaign and the Chicago Coalition for the Homeless, as well as people in town to protest the NATO summit this weekend, to march on Dart and on Citibank’s loop office. 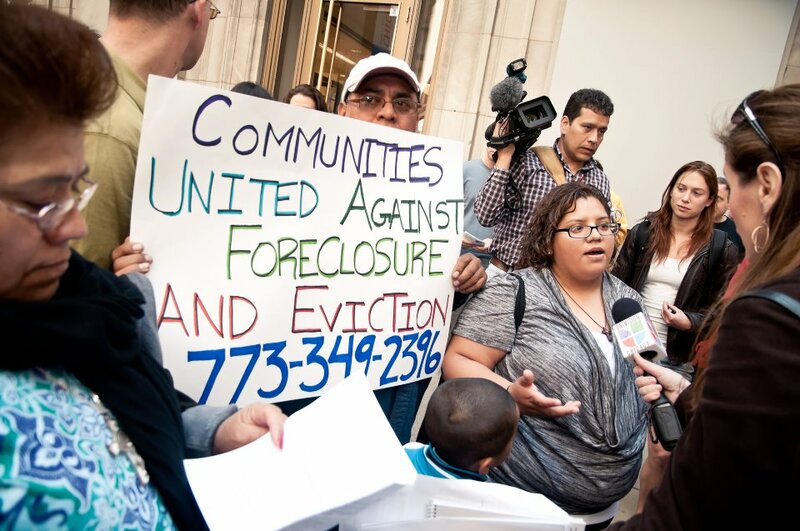 At Citibank, homeowners currently facing foreclosure by the bank shared their stories. Earlier this year, Citi agreed to settle a lawsuit charging that it had stuck taxpayers with $45 billion in bad loans that the bank had fraudulently insured with the Federal Housing Administration. ProPublica reports that, according to the whistle-blower who originally brought the case, the company actively undermined the process that was supposed to check for fraud in order to push through reckless loans and get higher profits. Citigroup settled the lawsuit for $158 million, or less than a third of a penny on the dollar. After the Citibank speakout, the group marched to Daley Plaza for a press conference and to deliver hundreds of petition signatures to Dart's office calling for the foreclosure moratorium. [See/sign the petition.] The Daley Plaza action included street theater of a bank trying to evict a family from their home -- and of neighbors stepping in to prevent their eviction. 30-year-old graduate student and teacher Jorge Ortiz, who has two children and is facing foreclosure, told the Chicago Tribune at the action that his monthly payments have jumped a thousand dollars to $1,600 at the same time that local property values have collapsed in the wake of the housing market crash. Almost 7.5 percent of mortgage loans on one- to four-unit residential properties in Illinois were in foreclosure at the end of March, compared with a national average of 4.39 percent, according to data released Wednesday by the Mortgage Bankers Association. Chicago has an epidemic of vacant and abandoned homes, estimated to top well over 10,000, with thousands more in foreclosure and at risk of vacancy and abandonment -- homes that could be occupied by homeless people and people who’ve been pushed out of their homes in the wake of the foreclosure crisis, says CUAFE and their supporters. Meanwhile, say housing activists, the largest banks -- which have admitted to committing massive fraud in home loans and foreclosures -- were able to settle what could have been hundreds of billions of dollars in liability for a fraction of that cost earlier this year, when the nation’s major banks settled with most states for $25 billion, as a means to effectively end those states’ legal action against the banks for mortgage fraud. Meanwhile, charge activists, the federal office investigating bank fraud locally is essentially unstaffed. We are moved to this action because of the intolerable losses suffered by our communities, friends, and families that we have witnessed: losses to businesses, to community life, and to family life; disruptions to the educational and social life of our children; and heightened neighborhood crime and insecurity. Because the “housing crisis” was generated by banks flagrantly violating all standards of responsible banking, this national disaster is more accurately called a “banking crisis,” and through this moratorium, we are requesting that you stand with us to protect our ravaged communities from the many predations we have suffered. This moratorium on foreclosures and unjust evictions will place the human right to housing above the "right" of banks to make a profit off of empty homes. If Sheriff Dart does not grant the moratorium, the People will enforce one themselves!